In Difficulties with the new Common Application I talked about how homeschool parents were supposed to become “counselors” to enter the school profile, counselor letter, and transcript. (No homeschool supplement any more, so any content that would have gone in the supplement now needs to be in those three documents or the student essay.) The methods described in that post did allow me to become a counselor (which is a special version of a recommender, and requires that the student designate you as such for at least one college). This week I finally finished all three documents that need to be uploaded. I had uploaded the school profile and the counselor letter with no difficulty, even replacing one counselor letter with an updated one that fixed some minor writing problems. But I had enormous difficult with the transcript. It is a fairly large pdf file (250kB), because it has course descriptions for all the courses my son took, and because I created it with Pages, which uses a very inefficient representation for formatted text (as bad as Microsoft Word’s). Common App claims to take PDF files up to 500kB, but every time I tried to upload the transcript, I got a spinning wheel icon that lasted forever, and the upload never completed. I got the same results with both Firefox and Chrome, so the problem was not browser-specific. In one test, I left the upload running and the Common App timed out after an hour, without having uploaded the transcript. I contacted the Common App help desk, and they seem to have gotten some of the bugs out of that part of the system (it no longer claims that they don’t respond to their e-mail). They sent me some boilerplate text that duplicated the workaround instructions on the web site, which I had already tried, but then concluded that if all else failed, I should e-mail them the transcript and where it should go, and they would manually upload it. I sent them the transcript last night, and by this morning they had uploaded it. I still can’t view it with Firefox, and they still have a bad message telling me to download the PDF, without giving me a button to download with, but I can confirm that it is there with Chrome. Bottom line: don’t get close to deadlines on submitting anything to the Common App—the software is still so buggy that manual intervention is needed even for routine tasks, and that takes time. My son has started requesting letters of recommendation. He has four people he is asking: two professors he took math classes from at the university, a theater teacher he has had acting classes with for about 12 years, and a history teacher he had last year. So far, three have responded to his e-mail request agreeing to write the letters, and he has registered them with the Common App. One has even managed to upload her letter already. He’s decided to try for Early Decision at Harvey Mudd. It is his first-choice school, and having an early deadline will help him get his essays for at least one college done. He will have to apply the University of California before hearing from Harvey Mudd, because UC has an earlier regular application deadline than any school that participates in the Common Application (the UC application forms have to be submitted in the month of November, while the standard deadline for almost all other schools is Jan 1). The UC schools are not as high on his list as Stanford and Brown, but he is almost certain to get into some of the UCs, and they are the only “safety” schools on his list. I just looked up the most recent common data sets on the university web sites for admission rates for male freshmen: HMC 12.7%, Stanford 6.8%, Brown 11.3%, MIT 7.2%, CMU 23.8%, UCB 17.1%, Caltech 9.0%, Olin 8.6%, UCSD 38.0%, UCSB 43.2%, … . Gender matters, since most of the tech schools admit similar numbers of males and females, but have far more male applicants. Note: the MIT figure is from 2011–12, the rest are from 2012–13, but I guess MIT is slow about updating their web site. I was a little surprised to see that CMU is less selective than UCB, since they are roughly in the same equivalence class for computer science (both great schools for grad students, but perhaps a bit impersonal for the undergrads). My son’s chances of getting in to a school are a little bit higher than the overall admission rates at that school, as he has good test scores (National Merit Semifinalist), an impressive transcript (I’m impressed, and I wrote the transcript! ), and good letters of recommendation (I hope—the only one I’ve seen is the counselor’s letter, which I wrote). But even with all that, his probability of getting in to each of the really selective schools probably only goes up to 20–25%. For the less selective UCs, it probably goes up to 90%—hence our considering them safety schools. I think he’ll get into at least one of his top six choices, if the essay writing doesn’t drive him crazy. I think he’ll also do well at any of the schools, but that they’ll shape him in different ways. I’m hoping that one of Harvey Mudd, Stanford, or Brown accepts him (which I estimate as having a probability of 40–50%), as I think those three are the best fits of any colleges we’ve considered. One consequence of his choosing to try for early decision at Harvey Mudd is that I have to fill out the CSS Financial Aid forms using 2012 data and estimates for 2013. To fill out the form, you need all your financial records in order, since they want to know all the information from your tax forms and every penny of your assets. I finally got around to doing my 2012 taxes last week (even later than usual for me), but the tax forms turned out to be easier than I expected. For the first time in decades, I was able to fill out the 1040A form instead of needing a 1040 with Schedules A, B, C, and D. Of course, part of this was because I didn’t have any interest income, business income, or capital gains—just my salary and my wife’s salary. I didn’t even try to compute itemized deductions this year, since they have come out almost exactly the standard deduction for the past couple of years, and I’ve not substantially upped my charitable contributions. Based on the Harvey Mudd net price calculator and all the data I collected for the CSS form, our net price there would be about $55k/year—it’s a good thing we’ve been saving for it since the day he was born. The other private schools would be similar, though the real net price would be higher for the East Coast schools, since the net-price calculator does not include the price of getting to and from the colleges, which would add a few thousand a year—only Stanford and UCB are close enough for public transit to be a viable option for getting to and from the college. One thing that irks me a little bit about the way that financial aid is computed is that saving for college is penalized—for every dollar you save for college you get almost a dollar less in financial aid, so which I think is a perverse incentive for people not to save for college. computer engineering project: designing and prototyping programmable, Bluetooth enabled light gloves with rechargeable batteries, to be manufacturable in small quantities for a retail price under $75/glove. computer engineering project: updating the Arduino data logger he wrote last year for my Applied Circuits course, with support for the Freedom KL25Z board and various new software features. Originally, I was going to do the Chemistry with him, and he was going to do the Group Theory on line with Jeremy Copeland of Art of Problem Solving. First, we decided that it would be simpler for him to do the AP Chem on-line through chemadvantage.org. (see my previous post), so I was off the hook for most of his courses. He’s doing the econ with his mother, and the English this quarter is writing: college essays, tech writing, and some writing for one of his theater classes—my only responsibility was to assign him some tech writing and evaluate it (and the hard part—getting him to do the writing I assign). Then Art of Problem Solving cancelled their group theory class, because not enough students signed up. As an apology, they offered him either a $50-off coupon for another of their courses or books or a free copy of the pre-publication version of the Groups and Fields book that Copeland is writing. He chose the book, so now he and I will work through the Copeland book. The last time I looked at groups or fields was about 1975, so I’m a bit rusty—but at least I’ve seen the material before, unlike the calculus-based physics we worked on for the past 2 years. Since the book is not published yet, I won’t be blogging problem numbers or details about the book (unlike what I did for the physics course). There are 18 chapters, so at a chapter a week I don’t expect that we’ll be done until the beginning of March. If anything slips in the winter, we may not finish until April. We’ll pick out around 10 problems a week to work on (trying to get all the Putnam problems from the chapter and a scattering of others). I don’t know whether he’ll be able to maintain the workload, even though over half his courses are ones he chose for fun, rather than required ones. Most of his time so far has been spent on the light-glove project: he’s putting in over 20 hours a week on that. He’s been keeping up on the econ (2–3 books read, 9–10 of the MIT OpenCourseWare videos watched), the AP Chem, and the theater, but falling a bit behind on the writing and the data logger. The group theory starts today, and the AFE One Acts start next Monday, so as of next week he’ll be at his full load for the semester. I think that he may have to delay the data logger project a bit—it would be nice to have some of the new features for the Applied Circuits class in the Spring, but we can manage on just last year’s code. The college essays can’t be delayed, though, so he needs to get back on schedule for them. Their current show (with two more performances on Oct 18 and 19) is in Broadway Playhouse, a convenient walking and bicycling distance from my house, where I’ve been to innumerable shows (mainly by WEST, but also several improv shows). The show is An Adult Evening of Shel Silverstein, a collection of 10 rather off-the-wall one-acts by Silverstein, plus a few Silverstein poems to open and close each half of the performance. I’d only ever seen one of the one-act plays before: The Best Daddy, which my son performed in as part of WEST Fringe show a year and a half ago. It may also have been one of the few that WEST could do with teen actors—the content of most of the plays is not suitable for teens. That said, I think that the teens did a better job of it than the MCT actors did. The MCT actors rather rushed through it, and Kathryn Wahlberg was not very convincing as 13-year-old Lisa. (Of course, the teens had the advantage that the actress playing Lisa was the age she was portraying.) Kathryn did a good job of Celia in Bus Stop, and an ok job of Lucy in Thinking Up a New Name for the Act (the weirdest script I’ve ever seen, consisting of only 3 words “meat and potatoes” repeated over and over with different business). She was too reserved in Buy One, Get One Free, which seems to me to call for rather exuberant acting. I thought that the best actor in the MCT production was Jackson Wolffe, particularly in Going Once, where he plays a singularly unpleasant auctioneer, but also as Bender in Smile and Theodore in The Lifeboat is Sinking. Janine Theodore did an excellent job as Sylvia in One Tennis Shoe, but was rather wooden in Going Once, and seemed too old for the parts in The Lifeboat is Sinking, Watch and Dry (the threat to tell her parents implied a teen or young adult on parental funds, not a woman of Ms. Theodore’s age), and Buy One, Get One Free (her age almost worked there, and would have if the actors had played with the age difference rather than trying to disguise it). Nat Robinson had a good New York accent for Bus Stop and Wash and Dry. His characterization for the latter was particularly good. Andrew Singleton had a particularly good blues-singer voice for Blind Willie and the Talking Dog, quite different from the voice for Harvey in One Tennis Shoe. Marcel Siero did a good job of performing the poems that bracketed the two halves of the show, though he tended to move too far forward on the stage, so that the lighting made it hard to see his face—a shame, since he has a particularly mobile face that he used to good effect in some of the poems. He was also a little too quiet on Invitation, at least for slightly deaf people like me in the back row. I know his projection is up to filling the Broadway Playhouse—he’s one of the few students I’ve had who was as loud as me in our outdoor voice projection exercises for grad students. Overall, I enjoyed the production and recommend it to people who are not easily offended by language and weird scripts. I wish that MCT did more productions in accessible locations, as I would like to see what they do with more conventional scripts. 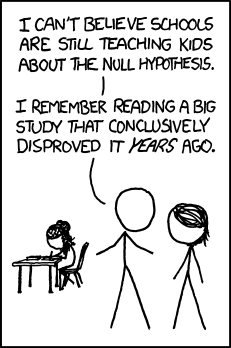 Today I had a student ask me to explain the joke—more precisely, to explain what “the null hypothesis” was. I did so, of course, explaining how the p-values that calculate how likely something is “by chance” need a formal definition of “chance”—the null model or null hypothesis. I even explained that all statistical tests do is to allow you to reject (or not reject) the null hypothesis—that they tell you nothing about the hypothesis you are actually testing. Given the casual nature of the question, I did not go into detail about how important it is to choose or construct good null models—ones that contain all the explanations other than hypothesis you hope to test. I normally spend a full lecture on that in my bioinformatics course, as well as one of the weekly homework assignments, having the students program different null models for an open reading frame that result in very different p-values for a protein-coding gene detector. Normally, I enjoy this sort of conversation with students—I like students who are curious and who are unafraid to ask questions to clear up things that confuse them. Today I was a little disturbed by the question, as the student had been in my office to get a signature on an approval form for a senior thesis in bioengineering. How had the student gotten that far in our program without having learned what a null hypothesis is? Where is the hole in our curriculum that allows that, and how can we fix it in the curriculum redesign this year? I realize that no curriculum design can completely cure the cram-and-forget disease that infects many college students, but I did not get the impression that this was a student who had known it once but forgotten. Rather, I had the impression that the concept was a new one, though the name might have appeared before. On looking over the bioengineering curriculum I see that students can take a probability course without any statistics course—perhaps that is what happened here. Unfortunately, biomolecular experimentalists have to be very familiar with null hypotheses and statistical tests, so I think we have patch the curriculum to make sure that all the students get statistics. One hears about bloggers making money off their blogs from advertising (I get nothing from the ads that WordPress.com puts on my blog—it just pays for the free blogging service). One also hears about bloggers getting sent products or books to review on their sites, as a form of cheap advertising. I’ve reviewed a number of things on my blog, but they’ve always been things I’ve bought retail, not promotional items. Yesterday I got my first free swag. 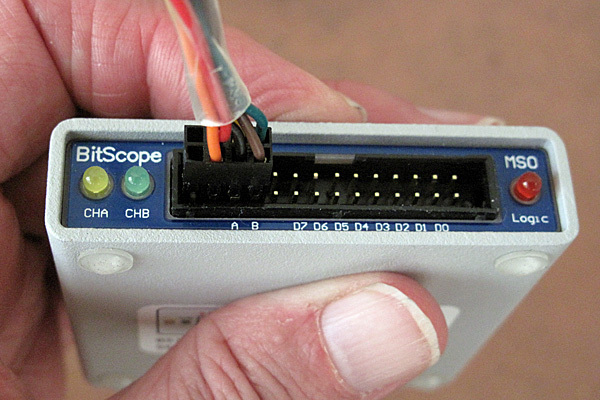 Bitscope liked my use of their Pocket Analyzer USB oscilloscope in my circuits blog posts, and are supposedly integrating some of my suggestions into their next software release. They offered me a chance to use and review a pre-production version of a new product: a front-end for the Pocket Analyzer that gives it the ability to do true differential inputs and AC coupling, reducing some of the limitations of the DC-coupling and having the analog ground be the same as the USB ground. I agreed to this on 2013 July 29, and they supposedly sent me one of the devices. I never got it, though, thanks to the combination of the Australian and US post offices (perhaps it is still on a boat circling the Pacific Ocean). Had I gotten the device over the summer, I would have probably spent a week playing with it, reporting the results on my blog. Now that the Fall quarter is in full swing, I’ll have much less time, what with teaching classes, grading programs, supervising grad students, and helping write grant proposals. I’ll probably be only able to put in an hour or two a week on it (I’ve already spent far more than that today on this blog post, and I’ve still not done any meaningful testing). I found the routing a little strange (Los Angeles->Memphis->Oakland), but I can’t fault the delivery speed. Within the US, I’ve always had very good service from the US Post Office, with prompt, low-cost delivery, but deliveries across the Pacific can be a bit iffy. It generally takes 2–3 weeks to get something from China through the Post Office, longer from India, and my success rate from Australia is only 50% (small sample, though). It may be worth paying extra for more reliable shipping from Australia and India. 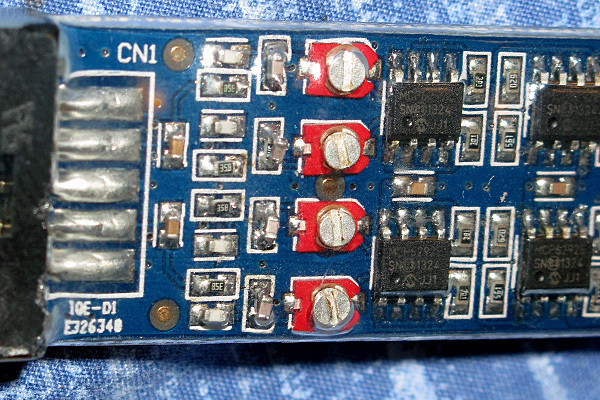 The probe PC board is about 6.2cm long and 2cm wide (8cm long with the connectors on the ends). The back of the probe has a connector with 3 twisted pairs that go to the Pocket Analyzer, and two jumper positions for shorting plugs that change the gain of the preamplifiers in the differential probes. The label on the probe says 2× without the jumper and 20× with the jumper, but I was told by email 0.5× and 5×, so I’ll need to test the gain for myself. There is no documentation yet, since this is a pre-production prototype. The jumpers for gain switches are a bit of a kluge, but I expect that sort of cost cutting on a USB oscilloscope. The other end of the short (~14cm) cable from the probe plugs into the leftmost pins of the Pocket Analyzer, connecting to 5v, 3.3v, A, B, and 2 Gnd pins. 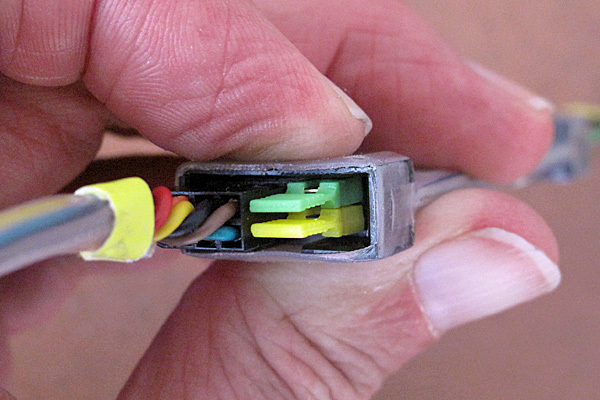 There are two blank positions on the left end of the connector, corresponding to the space at the end of the connector on the Pocket Analyzer. I suspect that the intent is to use this as a key to reduce the probability of plugging the probe in wrong. It probably won’t help much, as there is nothing stopping anyone from plugging it in upside down at the wrong end of the connector—the Pocket Analyzer uses a symmetric connector that has no keying. On the component side, we can see that there are are 4 main ICs (probably op amps or instrumentation amps, but I can’t read the labels through the heat-shrink tubing) and a number of discrete components. I’m assuming that the heat shrink tubing is a pre-production measure, and that they’ll have a classier-looking case once they go into production. (I’ve been recommending heat-shrink wrapping for the LEDs in the light gloves my son in designing, because I think that classier cases for the LEDs will be difficult for them to get made in tiny quantities, but I suspect that BitScope is looking at a larger production run than the first run for the light gloves). Taking a closeup photo of the input end of the probe with my camera lets me see the labels on the ICs. They seem to be MCP6292 E/SN chips (about 67¢ each from DigiKey in 100s). Those are dual rail-to-rail op amps with a 10MHz gain-bandwidth product (7v/µs slew rate), with a 2.4v–6v single-sided power supply. You can also see that the surface mount components have been hand-soldered, by someone who is worse at SMD soldering than me (that’s pretty bad). It looks to me like one of the components (a resistor?) has been shorted by a bad solder bridge. I assume they did some testing before sending me the probe, so I hope that this is an optical illusion, not a real short. I’ve not heard back from the BitScope folks yet what voltage range is acceptable on the inputs, so I’ll have to be rather cautious at first—the op amps don’t want inputs more than 1v outside the op-amp power rails, and I don’t know what voltage dividers there are before the op amp. I suspect that the bandwidth for the probe is around 5MHz in the low-gain setting, and 1MHz in the high-gain setting—I’ll probably have to take the setup into one of the student labs at the university to test this, though, as I don’t have much to use for comparison at home. It may be difficult to measure the bandwidth when the probe is plugged into the Pocket Analyzer, since the Pocket Analyzer itself has limited bandwidth. I can’t get it to sample faster than 5MHz, which gives an upper limit of 2.5MHz for the bandwidth. The online documentation for the BitScope claims 20M samples/sec is possible, but if I try to set that, the software claims that there is an access violation and does not change the setting. I think that the noise floor of the differential probe will also be set by the rather high noise in the Pocket Analyzer. The high-gain setting of the differential probe will allow somewhat better signal-to-noise ratios, as I doubt that the differential probe is anywhere near as noisy as the Pocket Analyzer, which seems to have ±3LSB on an 8-bit DAC (about ±1% of full scale). I wonder whether BitScope will try to take advantage of some of the newer processors (like the Freescale Kinetis L family) that have higher resolution ADC with probably adequate sampling rates.